Senators and staff discuss public election finance legislation Wednesday in the Senate chamber. When Sen. Phil Baruth (D-Chittenden) opted out of a lieutenant gubernatorial run last December, one of the barriers he cited was the state's restrictive public election financing law. In order to qualify for up to $182,500 in public funds, he would have had to wait until February 15 of this year to announce his intentions, even though two privately financed candidates had already done so last summer and fall. Baruth pledged at the time to introduce legislation that would level the playing field. 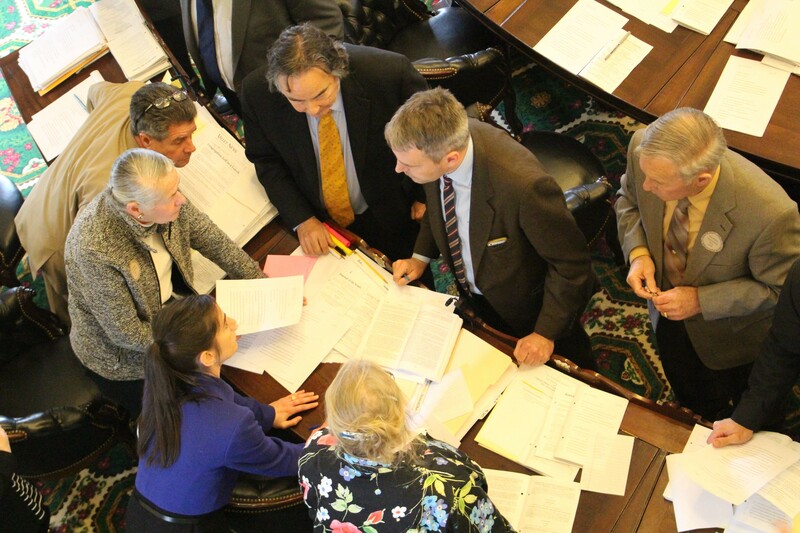 On Friday morning, the Vermont Senate passed his bill by a vote of 19 to 6. Not all his colleagues agreed with him. Sen. John Rodgers (D-Essex/Orleans), who is considering running for lieutenant governor, said he was worried that the change would encourage more candidates to seek public financing — and therefore cost the state more. "I think when we're using taxpayer money, the bar should be set a little higher," Rodgers said Friday on the Senate floor. But Sen. Joe Benning (R-Caledonia) said that even though he opposes the public financing program in principle, he believes it should not disadvantage those who make use of it. "That's basic fairness," said Benning, who is also pondering an LG bid. "A candidate still has a high bar." To qualify for public financing, those running for lieutenant governor must raise $17,500 in contributions of $50 or less from 750 Vermonters during a three-month period. Gubernatorial candidates must raise $35,000 worth of small contributions from 1,500 people in order to qualify for up to $415,000 in public funds. Senators struggled to come up with a mechanism that would allow publicly funded candidates to declare earlier without inexorably elongating the election season. An earlier version of the bill, which was debated on the floor last week and then again Wednesday, would have created several windows during which such a candidate could declare, starting 13 months before Election Day. But several senators said they feared that day would become the new, unofficial start date of the race. On Friday, Sen. David Zuckerman (P/D-Chittenden) proposed a different way to structure the bill. An amendment he offered would allow candidates to begin seeking public financing as soon as a privately financed candidate raised or spent up to $2,000 on a gubernatorial or lieutenant gubernatorial campaign — up to one year before Election Day. Vermonters, he said, "are not overly inclined to have campaigns that are longer than a year ... So this amendment that I'm offering took a hard and fast date out of the statute." Zuckerman announced last November that he would run for lieutenant governor this cycle. He claimed at the time that he would seek public financing, even though the law clearly barred him from doing so. A lawsuit he joined seeking to overturn elements of the statute was rejected by a federal judge earlier this month. The candidate explained Friday on the Senate floor that his amendment "allows a publicly financed candidate the option of starting as relatively early as a privately financed candidate." Zuckerman's amendment passed on a voice vote. The underlying bill now moves to the House.